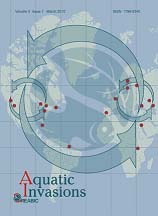 Aquatic Invasions is an open access, peer-reviewed international journal focusing on biological invasions in inland and coastal waters from around the world (please visit journal web site for more information). BioInvasions Records is an open access, rapid peer-reviewed international journal devoted primarily to publication of research and data papers on records of non-native species in aquatic and terrestrial ecosystems. The journal provides the opportunity of timely publication of first records of aquatic and terrestrial invaders and other relevant information needed for risk assessments and early warning systems (please visit journal web site for more information). Management of Biological Invasions Invasions is an open access, peer-reviewed international journal focusing on applied research on alien species and biological invasions in aquatic and terrestrial ecosystems from around the world (please visit journal web site for more information).